On our way home from Bicol, we took the "backdoor" that brought us to Kamay ni Hesus Healing Shrine in Lucban, Quezon which is the last town of Quezon before entering Laguna. 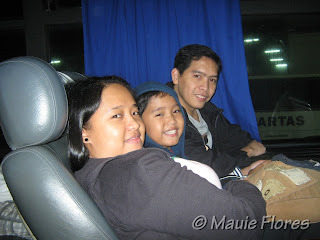 From there, we entered Luisiana, Laguna and through the towns of Cavinti, Pagsanjan, and Lumban. 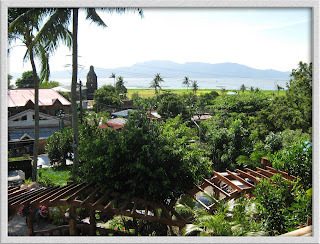 These towns are already familiar to me as we have already been to Paete, Laguna a couple of times in the past. The town before Paete is Kalayaan, and it is the town where travelers can find an interesting restaurant for a stop over. 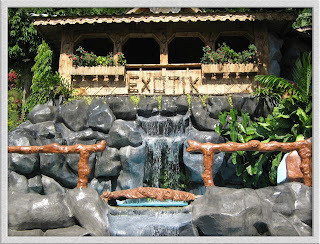 The place I am talking about is Exotik Restaurant. 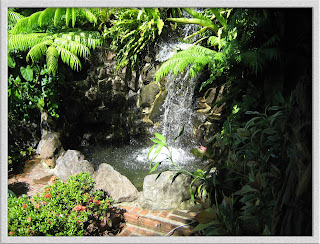 Exotik Restaurant is set beside a hill and landscaped with lush greenery. They serve exotic delicacies that cater to guests with adventurous palates. If you dig frogs, bayawak (wild lizards), snails, and usa (deer), then, this is the food trip for you! Don't expect me to try to eat something unusual, though. They serve other "usual" native Filipino foods, anyway. 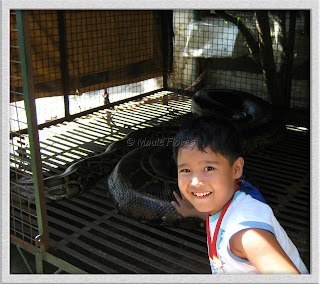 Another feature that makes Exotik a must-go for Laguna travelers is the presence of their pet birds, monkeys, fishes rabbits and pythons. 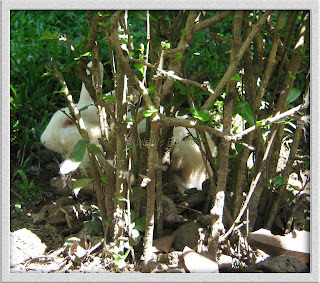 The pets do not only add to the exotic ambiance of the place but also serve to entertain the kids and young at heart. The first time we went to Exotic was back in 2001, we were with an American friend who wanted to buy some wooden crafts in Paete. The place was smaller compared to its present size. There are more bamboo cabana dining areas today. The pets were also fewer in 2001. Before, they only had the birds and a python named Samantha. By the way, back then, Samantha was smaller! Today, she looks like she can swallow a toddler! Another addition to the place is the swimming pool. There's a small slide connecting a bamboo hut to the pool. I guess, the use of the pool is exclusive to the guests of that hut only. Since we were still full from our lunch in Lucban, Quezon, we just ordered Halo-halo to freshen us up a bit. 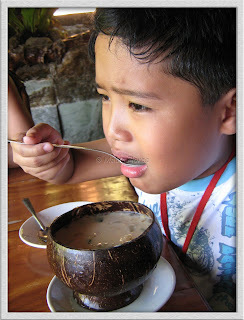 Our halo-halo orders were served in coconut containers. An order of halo-halo cost us Php 75 each. 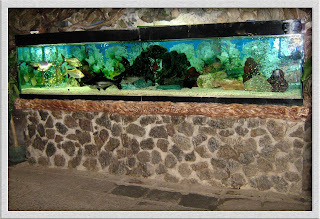 Exotik Restaurant is found along the national highway of Longos, Kalayaan, Laguna. 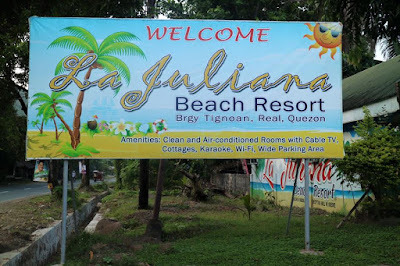 From the South Luxon Expressway, take the route going to Santa Cruz, Laguna. Enter Pagsanjan and exit to Lumban. 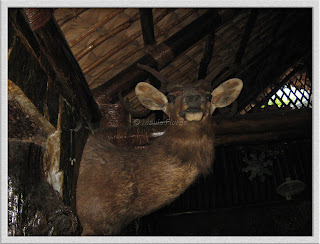 Kalayaan is the next town and Exotik Restaurant is just beside the highway before you reach the Kalayaan-Paete boundary. 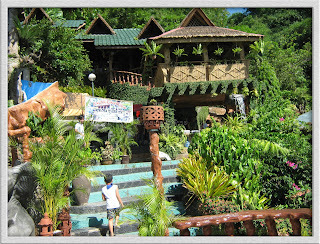 From Calamba, you need to go to Santa Cruz passing the towns of Los Baños, Bay, and Victoria. From Santa Cruz, enter Pagsanjan town and follow the directions above. From Antipolo, take the route that will take you to Siniloan, Laguna passing through the towns of Teresa, Morong, Baras, and Pililia. From Siniloan, just drive straight towards the towns of Pangil, Pakil, and Paete. Kalayaan will be the next town after Paete. From Lucban, Quezon Province, just drive straight towards the towns of Luisiana and Cavinti, Laguna. The next town after Cavinti is Pagsanajan. From there, you have to take the road going to Lumban. The next town is Kalayaan. 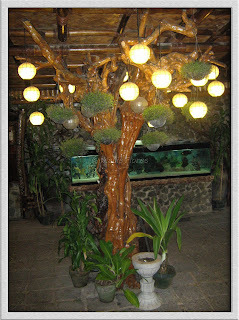 Recently, we traveled roughly 3 hours from Makati to Kalayaan, Laguna to visit this popular restaurant. 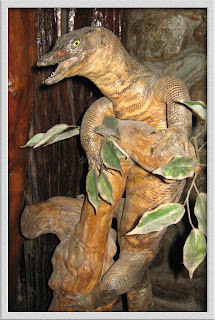 Bedecked in native furnishings and adorned by a few caged pythons and other species that are strategically situated, this place, at first glance, is true to its theme. Although a few dishes are foreign to most palates, the pricey menu is dominated by typical native and non-exotic dishes. What’s the point? After navigating through the menu, we ordered snake and frog dishes, but they didn’t have those in stock, which completely defeats their vision. Again, what’s the point? So we ended up ordering crocodile meat in gata, tanigue ceviche, lechon kawali, steamed veges and ho to tay soup, but we were disappointed when our orders came in. The portions were small and full of extenders! Tanigue, for example, was full of red onions and only a few pieces of fish. It was like ordering Onions with Tanigue! The crocodile dish was acceptable taste-wise, but there were only 5-6 small sized pieces of meat! The rest was hot pepper and some kind of vegetable. The soup was very salty and dominated by the taste and smell of fish sauce. We asked them to replace it, which they did. Lechon kawali was dry and the steamed veges were not properly done. The only good thing about this experience was their service. Bottomline, like most people, we do not mind paying the listed price, but everything must be commensurate. Now, if you want to see exotic animals, go to the zoo. If you want to taste them, cook them yourselves. This place is basically a TOURIST TRAP. As we say in New York City, fuggetaboutit! 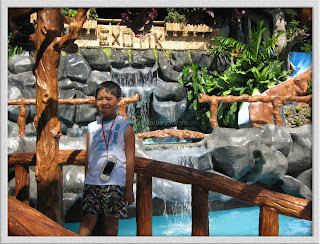 To all parents of kids who want to go swimming at EXOTIK Laguna, pls. be careful. I will never recommend this place to anyone. Thanks for spreading my word.